In my first review of this new lathe, I brought up 3 things that I felt needed improvement. One was the tailstock quill thread that was reversed, the second was the indexing was hard to read and the third was the on/off switches being flat and in different locations. Well two out of three are fixed and the third I’ll have to live with ( maybe). The new quill and screw were installed in the tailstock but I had to relocate the key pin to the bottom so I could read the graduations that are on the new quill. I did not want to do indexing using a flashlight to see the index location so I built a new index wheel that you can easily read from the front and it has locations at every 5 degrees. I still cannot change the on/off switch so I find myself hitting on for off and off for on. That switch needs to be in one location. I think I have found the contacts for the touch switches and need to do some testing before mounting a single switch out front to do both. That will probably void my warranty. 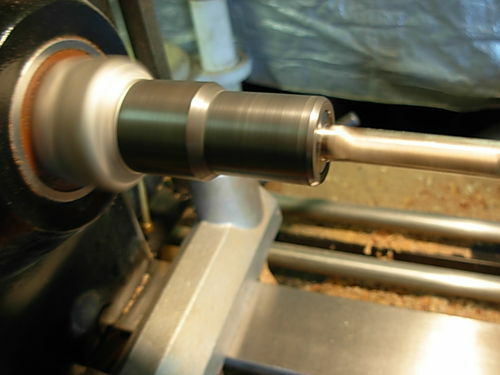 I also did an enhancement to the lathe for using collets from my metal lathe in it. I have a set of Southbend collets from 1/8” to 1/2”. They are used in the spindle with a drawbar through the center of the spindle. I built a collet holder with a 1 1/4” -8 thread from a nut I bought on line and some steel parts I had to turn on the Southbend lathe. This was fun because the thread on the collets is a .642” x26. That thread does not exist in any books but I can cut 26 thread per inch on the Southbend so it was not a problem. The collet screws into the threaded sleeve on the end of the drawbar and then is pulled tight with a handwheel on the back of the lathe. I made a little video showing the index wheel and the collets in use. there is a dead spot n the video where the index pin unthreaded a bit and would not retract far enough. I put Locktite on it and that won’t ever happen again. I was able to make this collet holder because I had previously made some threaded concentric mock spindles which I can turn any attachment for a 1”-8 or 1 1/4”-8 thread and they will be right on center because the threads were cut right on the metal lathe. I put gun bluing on all the collet holder parts. That’s quite a nice indexing wheel! Thanks, Lew. I have used it 3 times already..once for steel parts!! It is an accurate dividing head for all kinds of projects. Another toy? Looks like a nice one! Great easy to read indexing system Jim. Well done Jim….....When you cranked it up it ran remarkably true….Totally out of my ability range, but it is easy to see you did some mighty fine enhancement on that Lathe. I enjoyed the Video and found it very informative. Hi Joe. I’m thinking of a double pole momentary contact toggle switch for the off/on. I think I’ve found the two pair of terminal that come from those flat switches. If so, I’m all set to test it. I don’t ever use that red emergency stop button- it is in a third location!! Hi Tony, I have shirt from a my one and only turning seminar with Lyle Jamieson and it says “I’m Into EASY” and that fits me to a T!! If it ain’t easy, it is a pain to use all the time! 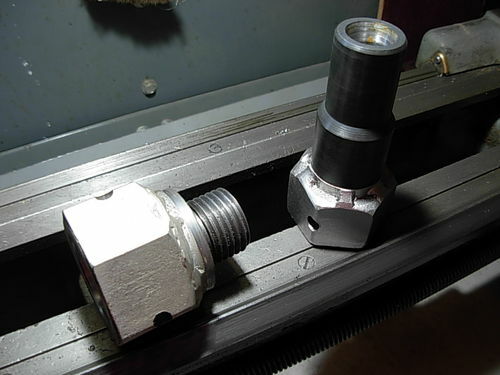 I modify everything to make it easy…even new lathes!!! Hi Cliff. It is right on. I did some tops in it last night to try it out and it makes them so easy to make now!! I was going to scrap the video and make a new one, but this had everything in it.Then the locator pin for my index wheel unscrewed a few threads and I could not see what was keeping the spindle from turning when the stops were both locked out. I put Locktite on the treads and it is now permanently set. As I said before, that indexing system is top notch Jim. It would be great to get the industry to adapt to that. Nice to see you have the collects working on the nova. Although I have gotten use to the on/off switch on mine, it will be interesting to see what you come up with. Thanks for the tip for FMW fasteners. 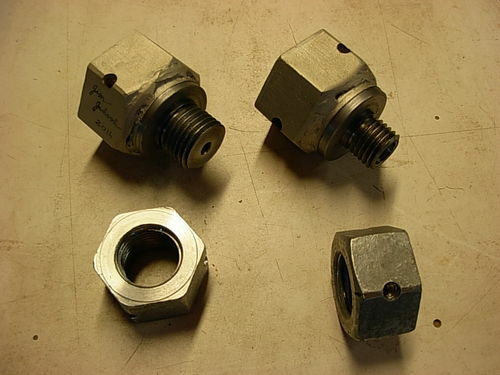 I have been looking for a acme threaded nut for a project and like you said they are expensive everywhere. I will look into it. I’m with you and prefer a single, simple, mechanical on/off switch. The difference with this lathe is that it is a computer controlled motor and I am not sure what type of signal to the circuitry is needed. I don’t think it can be a full on switch but maybe a momentary contact switch with a just a pulse to complete the circuit between the contacts. The engineers at Nova won’t tell me which way to go . I’m going to find the contacts and , with the power off, see if they remain closed when the switch is depressed. If they do, I would use a double pole double throw momentary contact switch and use a separate pair to replace each touch switch. That would leave the touch switches there and still functional . I like to just look out of the corner of my eye and turn it off or on and I can’t do that here. I have to look at it and hit it right in the center!! I’m not a computer guy so I don’t know how that stuff is designed.